(Philadelphia, PA) – The American Heart Association (AHA) has named Temple's Walter J. Koch, PhD, winner of its prestigious "Basic Research Prize" for 2017. 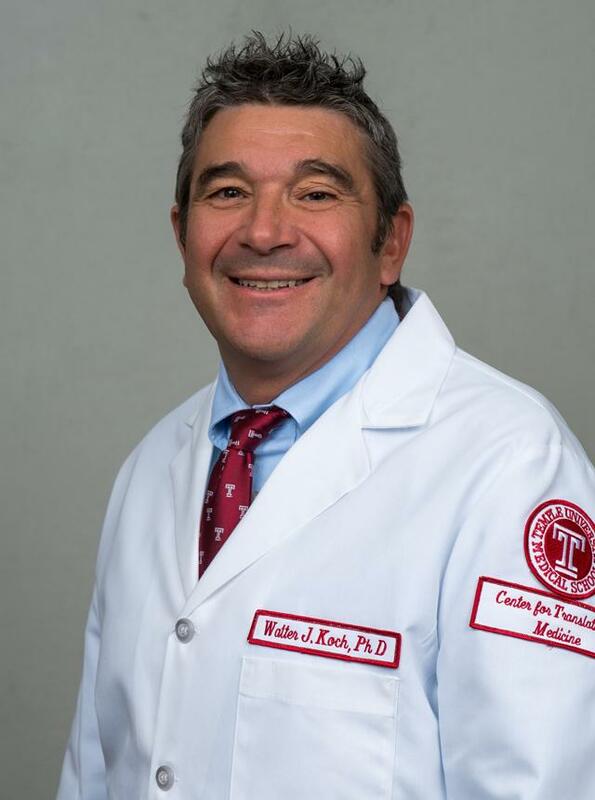 Dr. Koch is the William Wikoff Smith Endowed Chair in Cardiovascular Medicine, Professor and Chair of Pharmacology, and Professor and Director of the Center for Translational Medicine at the Lewis Katz School of Medicine at Temple University. The award was announced at the AHA Scientific Sessions 2017 in Anaheim, CA. Dr. Koch was declared the winner "for seminal contributions to basic cardiovascular research based on molecular signaling of cardiac injury and repair and cardiovascular gene transfer, studies that have identified novel molecular targets for treating heart failure and advanced prospective therapy to the doorsteps of clinical trials." The Basic Research Prize is awarded annually and was created to "celebrate the leader of a research laboratory who has made major praiseworthy contributions to cardiovascular science." "I am humbled and honored to be the 2017 recipient of the Basic Research Prize from the American Heart Association," says Dr. Koch. "Any success of mine is primarily due to the outstanding mentorship that I have received over the years. Our success over the last two decades is also due to the dozens of outstanding trainees that have spent time in my lab. I know that with these smart and talented young scientists we will continue to make key contributions, and I look forward to the journey ahead." Dr. Koch is a nationally recognized leader in translational research. Over the last two decades, he has focused on an enzyme called GRK2, which stands for G protein-coupled receptor kinase-2. Levels of this enzyme rise when the heart is failing. Research by Dr. Koch and his colleagues has shown the role of GRK2 in heart failure, and that inhibiting GRK2 could reverse heart failure in various mouse models. A recently published study by Dr. Koch's team showed that paroxetine can reverse heart failure in mice due to GRK2 inhibition, and work is currently underway to develop chemical compounds that might become drugs targeting GRK2. Dr. Koch earned his PhD in pharmacology and cell biophysics from the University of Cincinnati in 1990, and subsequently completed a Howard Hughes Postdoctoral Fellowship at Duke University Medical Center. While at Duke, he started a molecular cardiovascular biology laboratory and became a fully tenured professor of surgery. In 2003, Dr. Koch moved to Thomas Jefferson University to create and lead a Center for Translational Medicine. He joined Temple's Lewis Katz School of Medicine in 2012. As principal investigator and project leader of several multi-million dollar NIH grants throughout his distinguished career, Dr. Koch has overseen numerous advances in cardiac research. Temple University Health System (TUHS) is a $1.8 billion academic health system dedicated to providing access to quality patient care and supporting excellence in medical education and research. The Health System consists of Temple University Hospital (TUH), ranked among the "Best Hospitals" in the region by U.S. News & World Report; TUH-Episcopal Campus; TUH-Northeastern Campus; Fox Chase Cancer Center, an NCI-designated comprehensive cancer center; Jeanes Hospital, a community-based hospital offering medical, surgical and emergency services; Temple Transport Team, a ground and air-ambulance company; and Temple Physicians, Inc., a network of community-based specialty and primary-care physician practices. TUHS is affiliated with the Lewis Katz School of Medicine at Temple University, and Temple University Physicians, which is Temple Health's physician practice plan comprised of more than 500 full-time and part-time academic physicians in 20 clinical departments.